Stretching – Static or Dynamic? If you haven’t already, stop doing static stretches before your event or training. Before running, or any sport for that matter, dynamic stretching is the way to go. Dynamic stretches are designed to a take a joint or a muscle through a challenging and repetitive motion. We start slowly, and with each rep continue to move the body part further into range. Do not bounce or jerk into the end of range. A dynamic stretch is a controlled movement. Dynamic stretches prior to running are aimed at targeting ankle joints, calf muscles, hamstrings, hip flexors and quads, hip joint, and lower back. If you do a combination of movements you can address numerous joints in specific movements. 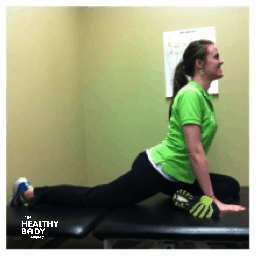 Here are a few dynamic stretches that can be done before an event. Dynamic stretches are designed to a take a joint or a muscle through a challenging and repetitive motion. Start in the push up position, from here you can go into either a lower back stretch, arching your lower back or into a calf stretch walking on the spot. You could also use this as your start position, returning to this after different stretches. Following your calf stretches, which consists of walking on the spot as opposed to holding the stretch, you can move into a hamstrings stretch, keeping both hands on the ground legs straight and gently walking your hands up as far as you can go. You can then walk back down into the push up position, and repeat with the goal of having both hands holding onto your feet. Moving from this position into the starting push-up position again, and then into a lower back stretch. From here you can bring, one leg up and across, as shown by the lady in green. This is a great stretch, it addresses hip capsule tightness, hip flexor, and lower back all at once. There are plenty of variations and different stretches to address all different parts of our body. This is a small glimpse of some dynamic lower limb stretches, don’t forget your trunk and thoracic region, neck and shoulders. Static stretches when done prior to an event can decrease muscle performance by up to 9%. However, when done after an event, static stretching is a great way to cool down and allow the body part being stretched to relax and gain small amounts of increased range. They will increase flexibility and reduce the tightness that we get the day after we train. Static stretches post-exercise include, hamstrings, calf, gluts and quads. If you would like a more tailored program for your sport also taking into consideration any injuries you may have make an appointment to see Jude Holroyd. 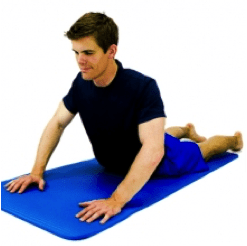 He can tailor a stretching regime that will optimise your performance.